Among the many notable achievements in his career, New England Aquarium president, Howard “Bud” Ris, probably never imagined he would have a North Atlantic right whale named after him! But after nine years at the helm, the Right Whale Team decided to name a whale "Bud" to commemorate his vital contribution to the Aquarium and his deep commitment to right whale research. When Bud attended his final board meeting as acting president and CEO of the organization last week, Dr. Scott Kraus, V.P. of Research, presented him with a plaque displaying the whale's photo and new name-- an honor that has only been bestowed on a few humans over the past 30 years. In this picture from 2012, Right Whale Catalog #1301 ("Half Note") on the left and Catalog #1158 ("Bud") on the right are seen associated with each other. All North Atlantic right whales receive a four digit Catalog number which is used to refer to the whale in the field and in the Catalog database. The Catalog number is essentially a way to track and organize all the sightings and life history of an individual whale. In the early years (the 1980’s) of the Aquarium’s Right Whale Research Program, a few whales that were most commonly seen or that had a distinct physical feature were given names. Perhaps a scar looked like a Piper Cub airplane (Catalog #2320, "Piper"), or two callosity islands were fused together to form a perfect heart (Catalog #1701 "Aphrodite"). Over the years more and more whales have been named. In fact, the process of naming whales now is very official and democratic among the members of the North Atlantic Right Whale Consortium, with an annual nomination and voting process. The original ideals of what constitutes a good name still hold true: a name should represent a distinct physical feature that can be easily seen and distinguished in the field. But in a few very rare cases, a whale has been named for a person who showed extreme dedication and support to the right whale cause, and this is definitely the reason we have named Catalog #1158, "Bud". She (yes, Bud is a female--the whale, not the human!) has a long history of being a good “bud” or “buddy” to another right whale, "Half Note", (Catalog #1301). The two female whales have a long history of being sighted together and actually have the longest documented association of two individual North Atlantic right whales. In fact, Aquarium researcher Philip Hamilton’s Master’s Thesis on right whale association highlighted this unique relationship between Half Note and Bud. NEAq President Bud Ris holding his certificate of honor which names right whale #1158 "Bud." You can see and learn more about Bud and other right whales by searching the online right whale catalog. Today (May 16) is Endangered Species Day. According to the Center for Biological Diversity we have lost approximately 1,000 known species in the past 500 years to extinction. As shocking as that number might seem, it doesn't take into account the thousands of possible species that have gone extinct before ever being discovered. Can we say "Happy Endangered Species Day! "- or is that an oxymoron? I'm not happy that we have endangered species, but I am happy that we can take the time (even if it's just one day) to recognize all the hard work by the many people who help endangered species. I think today is a good day to reflect on all the things we can do to help endangered species both locally and worldwide. I know I can do more. Can you? North Atlantic right whales are endangered, with a current population estimate of about 500 individuals. 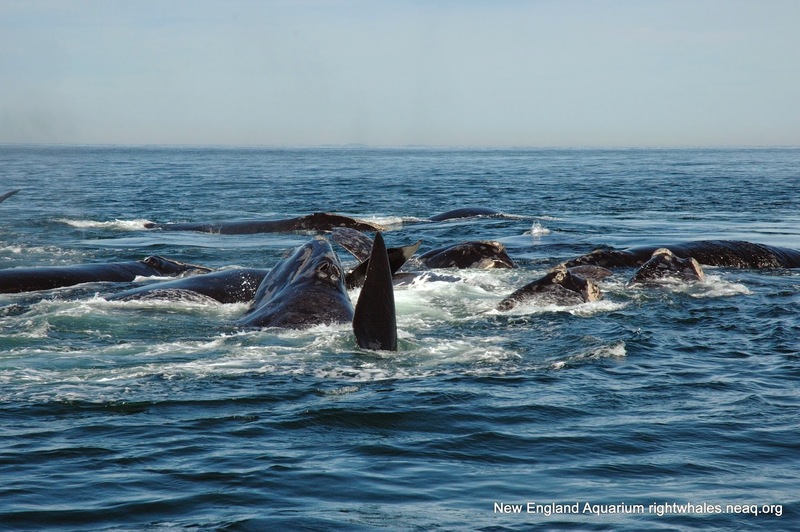 Please enjoy this video about some of the challenges, defeats and accomplishments of the Right Whale Research Program here at the New England Aquarium. If you're feeling inspired, consider sponsoring a right whale or subscribing to our print newsletter- 100% of the proceeds go towards our research. I think spring has finally sprung here in Boston. Spring is a great time to get outside and celebrate your local community and environment. This weekend we are celebrating the North Atlantic right whale with an inaugural Southern New England Right Whale Festival here at the New England Aquarium. If you live in or are visiting the Boston area you should come check it out. Be sure to stop by the NEAq Right Whale Research Team's table and say hi. Please come and celebrate the right whale community and its hard work, dedication and efforts to save and protect the North Atlantic right whale.